Oak X-Ray Holder -- Organization is the Key! 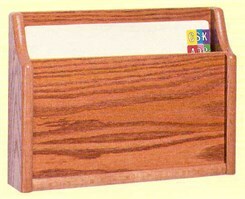 The Oak X-Ray Holder is made of solid oak sides and bottom with an oak veneer back. Pocket is 20-1/2"W x 2-3/4"D. Includes hardware for easy wall mounting. Overall 22-1/2"W x 3-3/4"D x 12"H. Shpg. wt. 8 lbs. PRICE INCLUDES FREIGHT! Please allow 1-2 weeks for delivery.